Me, too! I think I had 3 helpings, lol. If you get around to making it, let me know what you think. Have a great weekend! Sounds delicious and hearty and a great soup for a rainy day to warm up your stomach and heart. Thanks for sharing on Real Food Fridays. Pinned & twitted. What a perfect soup for early fall’s chill. Thank you. Love all that cream, has to be good. Thank you! It was super comforting. I usually use a mix of cream and milk when I make chowder to lighten it up a bit, but this time I felt like I really needed a full fat creamy chowder, lol. Have a great weekend! Thank you for sharing it with us at FF! 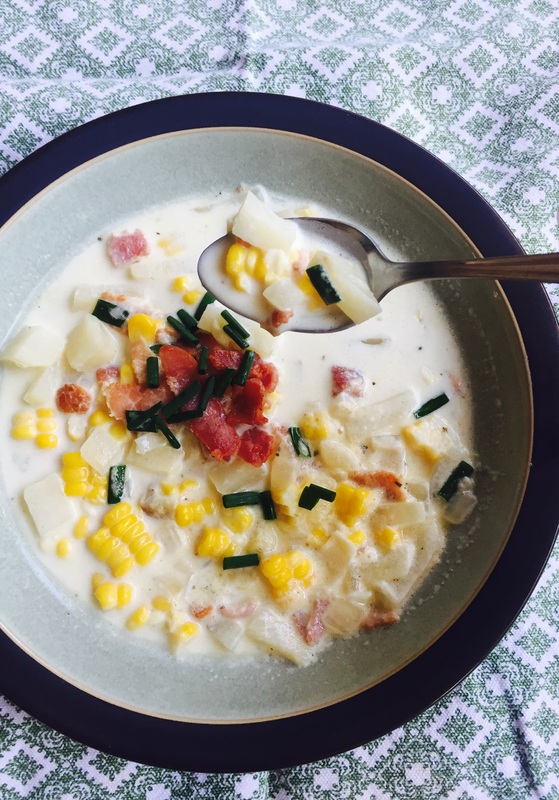 It’s hard to beat fresh corn chowder with bacon! Looks great. I am a fan of bacon, and I’m sure it’s delicious in here! I have to admit I’ve never had a corn chowder (now, in my defense, I am Italian and I haven’t been here in Canada long enough 😉 ). But I’m really loving the look and the flavor of this chowder! I have to ask my husband to make it (minus the bacon, for me). It looks amazing! This is soup perfection! I’m looking out the window right now and trying very hard to imagine a bowl of this right onto my desk. Wouldn’t it be cool if maybe one day, humans could develop the ability to dream up food and have it appear? Haha! That would be amazing! It would be kind of like the simulator in Star Trek. Maybe one day, lol.